Ellie with the zombie Christmas tree. I love zombies because they scare me the most. I think it’s because, for the most part, they have no individuality. Once a zombie bites a person, they lose their personality, can’t talk and carry on a conversation, and look at humans as a food source. Except for certain stories where the usual zombie trope is abandoned, like in Mike Carey’s Felix Castor series, where Nicky the zombie is full of sparkling wit, a zombie is quite predictable, which is oddly comforting. This has been a zombie year for me and my sister with the second season of The Walking Dead to look forward to every Monday night. We don’t have a TV or cable, so we bought a season pass for the series on iTunes because we couldn’t wait for the series to come out on Netflix. After each episode comes out on Sunday, I download it and then we watch it after Kristi comes home from work. The series is on hiatus right now until February, so we’ve had to further our zombie love another way. What better way than a zombie Christmas! Usually, a few days before the holiday, we pull out a miniature light-up Christmas tree that my mother bought us during a post-Christmas sale about ten years ago. (My mother loves sales!) We set it up, unbend the branches, and then decorate the tree with a few disco ball ornaments and some old Mardi Gras beads for a garland. The tree stays up for about a week, until we get sick of the cats knocking it down, and then we pack it away in the box until next year. Our traditions had become a bit stale. 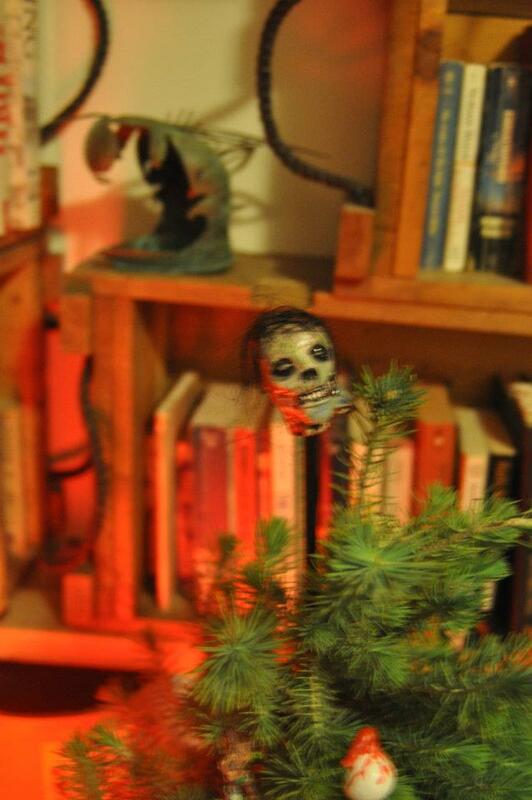 After Kristi and I decided on a zombie Christmas, we felt that our standby tree just wasn’t going to cut it. We really needed proper greenery to showcase the zombie ornaments that Kristi was planning to make. The green would make that desiccated flesh pop. We shopped along Cortelyou Road in our neighborhood, looking for something that would suit our needs, and finally found one at the second bodega we stopped at—a tiny potted pine for $25. A steal. We popped it in our cart and wheeled it home. For the next few days, Kristi worked hard, perfecting her recipe and method for making the zombie ornaments, patting and molding eyeballs, bones, and gangrenous hands. At last she came up with some worthy pieces and set to work mixing up moldering flesh paint colors and finding bristly hairs and trims for the ornaments that needed it. 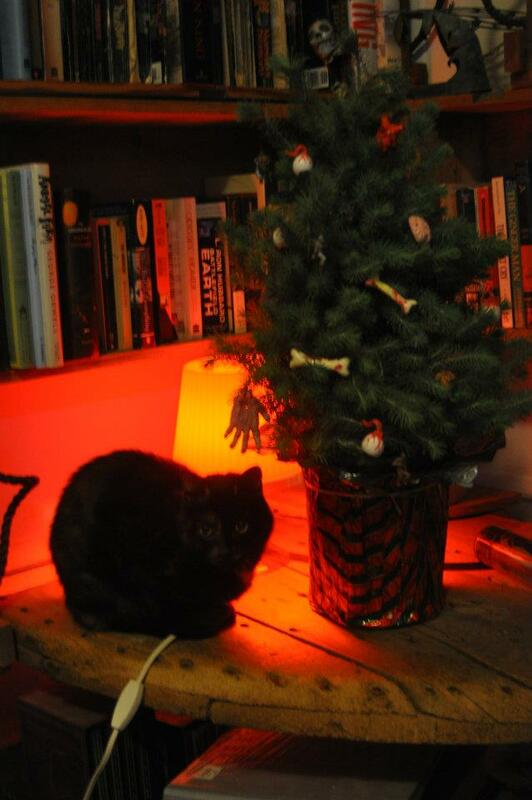 Our finished tree was a wonder to behold, and the cats liked it. They haven’t knocked the tree down once. On zombie Christmas day, we cackled while putting together our holiday dinner: “Jesus was the first zombie. He rose from the dead.” “And you eat his body and blood during Communion—that’s soooo zombie.” Our dinner was rather plain compared to usual zombie fare—duck (which I kept calling a goose), wild rice, asparagus, and pineapple upside-down cake, though we did have a thick sauce that looked like blood. After present opening and dinner, we devoted the rest of the day to catching Kristi’s boyfriend Ed up on Walking Dead episodes. One really great thing about a zombie Christmas is that it’s hard to overeat. You never know when the guts and blood will start flying, so it’s best not to have anything in your mouth—unless you want to lose it. Does American Horror Story Have Legs?